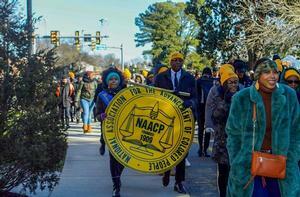 Student organizations marching in honor of Rev. Dr. Martin Luther King Jr.
HAMPTON, Va. (January 22, 2019) – Hampton University held its annual Martin Luther King Jr. march and program on Monday, January 21, 2019 to remember his life and celebrate his birthday. The student-led march began at the historic Emancipation Oak and ended at the Memorial Church on campus where the program was held. Various student organizations and campus leadership groups participated in the memorial march in honor of Dr. King and his legacy. The University program was filled with praise and worship as Rev. 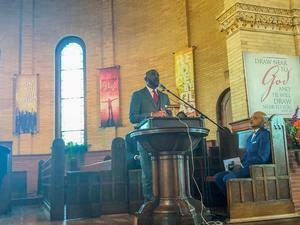 Dr. Jerome A. Barber, Pastor at Sixth Mount Zion Baptist Temple, began the ceremony with opening prayer. A graceful musical selection was prepared by The Voices of Greer, followed by Hampton University Senior Class President, Mr. Michael Adams, conversantly educating the audience on the purpose of the march. The program’s keynote speaker was Bishop Derek T. Triplett, founding pastor of Hope Fellowship Church in Daytona Beach, Florida. As a powerful and profound speaker, Triplett has spent over twenty years in pastoral ministry and over twenty-five years preaching the Gospel. He also provides spiritual leadership to several churches and ministries across the country. As a gifted preacher, teacher, and speaker, Triplett’s moving speech during the ceremony educated the audience on the history of Dr. King. “Dr. King was needed for the time in which he served. I would like to say to you, you are needed. He was not trying to be a hero. His name was never meant to be what he ultimately became, but life thrust him into circumstance. He was called into service and that service ultimately consumed his life, defined his life, took his life, but also, immortalized his life,” Triplett said. Also, during his motivational speech, titled, “We Need Your King,” Triplett encouraged the audience to find their true passion in life. The program concluded with harmonies from The Voices of Greer singing the Black National Anthem. Rev. Dr. Martin Luther King Jr’s., “I Have A Dream” Speech was delivered on August 28, 1963 at the March on Washington for Jobs and Freedom. His mother, Alberta Williams King, attended Hampton and was in the class of 1924.